The purpose of preparation is to extract a portion of oil by mechanical pressing while providing pressing cakes for extraction plant. Main processes include: Seed Cleaning & Weighing, Cracking & Dehulling, Flaking, Cooking, Pressing, Oil Residue Separation. The meal is highly appreciated thanks to its high protein content (45-50%) as animal feed, especially for large breeding. The most delicate point in case of insufficient decorticating is the excessive content of cellulose of the meal, which makes it indigestible for some animals (poultry and pork). The sunflower oil contains approximately 1.5% of lecithin (phosphatides) as main part of the unsaponifiables. Separated before neutralization, it is re-incorporated into the extracted meal. 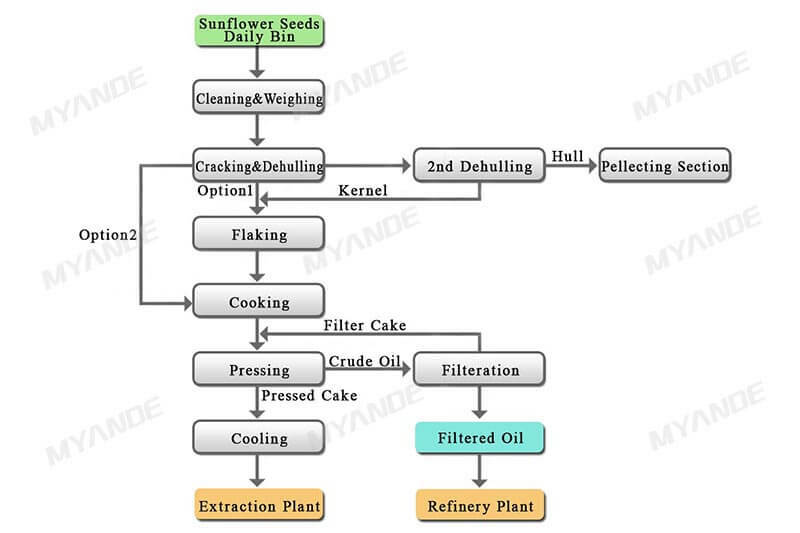 In the unsaponifiables of the sunflower oil, the waxes also represent a fair amount. Those waxes, at cold temperature, are quite insoluble in the triglycerides and have a tendency to precipitate, which gives the oil a turbidity aspect, which is detrimental to marketing even if waxes are not contrary to the intrinsic value of the oil. As the waxes come from the shells, it points out the importance of the decorticating; the latter is counterbalanced by the fact that a certain amount of shells are necessary for a good prepressing and by the oil loss through the entrained seed. The waxes can be eliminated from the oil by winterizing. 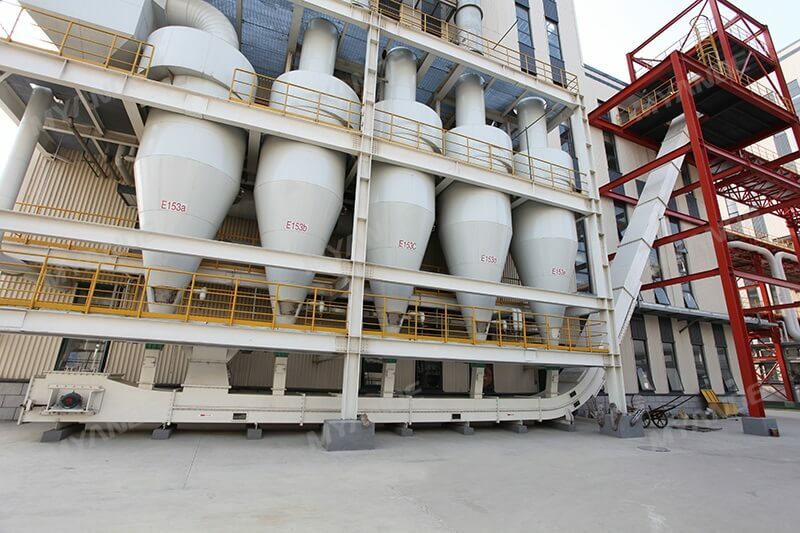 Different processes have been developed in that respect, dewaxing by centrifuge after neutralization, dry winterizing with or without filter aid. 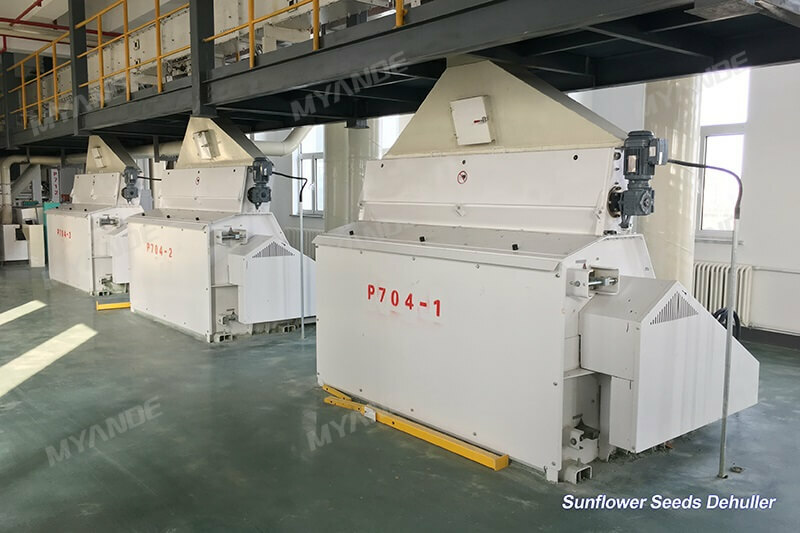 Sunflower seeds from daily bin or warehouse is treated by magnetic separator, weighing scale and screener to remove impurities. 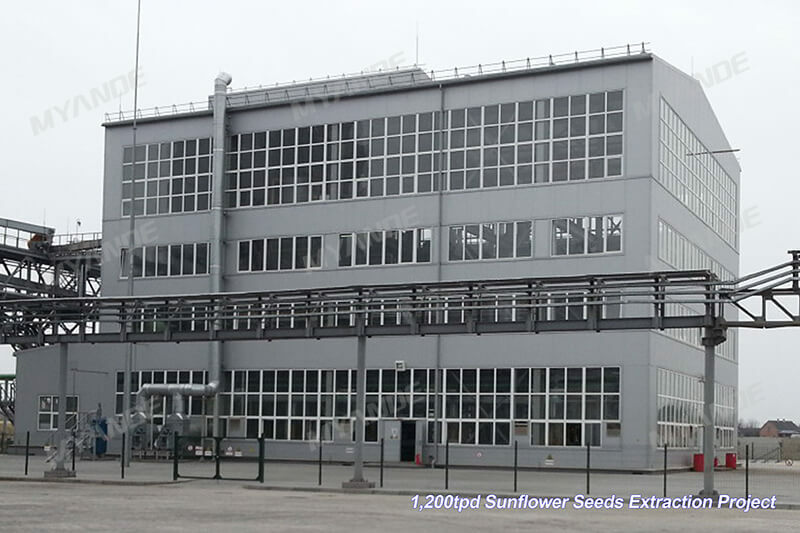 The purpose of softening is to adjust moisture, temperature and tenacity of sunflower seeds before flaking. 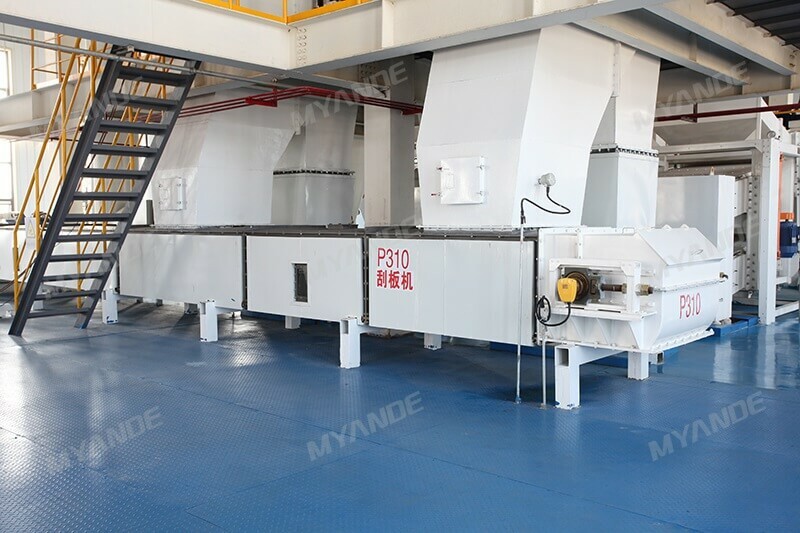 The purpose of flaking is to flake the broken flower seeds into thin flakes (from 0.3 to 0.35mm) for the subsequent oil extraction through mechanical pressing. In addition, flakes thickness can be adjusted through roll pressure adjustment device. 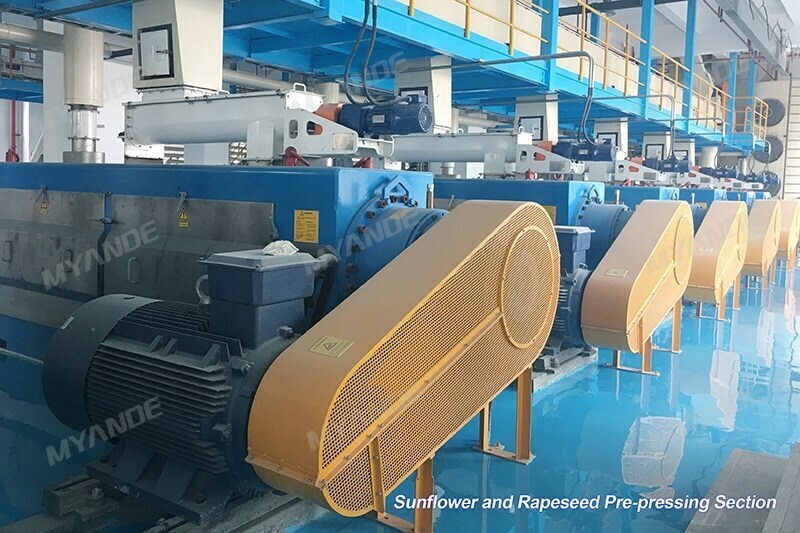 Horizontal Drum Rotary Cooker is designed to adjust temperature and moisture of sunflower seeds flakes prior to mechanical pressing, improving oil yield greatly. Due to high content of residue in crude oil, it is necessary to separate oil residue by oil drag conveyor firstly, crude oil then enters to settling tank for further separation. 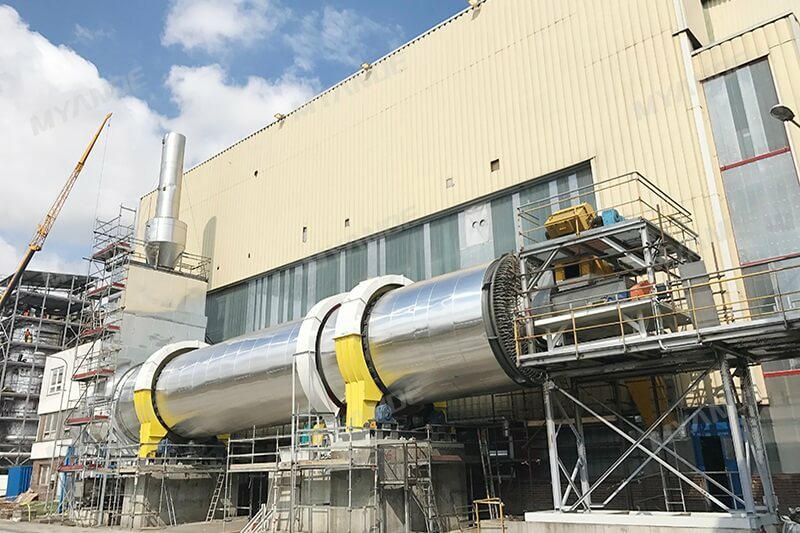 Collected residue is returned to pressing section while crude oil from settling tank is pumped to horizontal screw centrifuge or leaf filter for further removing impurities. Hydraulic turning cooler with complete set of wind network system is designed to cool down pre-pressing cakes to 55~60℃, then cakes is conveyed to the extraction plant.